My latest CSA box from Full Circle Farm included beets and celery root. Although I prepare them a variety of ways, seeing fresh beets in pristine condition always brings to mind two of my favorite foods: oven-roasted beets and skordalia (pronounced skor-thal-YAH), an intensely flavored Greek garlic spread. The sweetness of roasted beets and the piquancy of skordalia make one of those perfect food combinations in which each flavor improves and completes the other. Skordalia typically uses pureed bread, potatoes, or nuts as the vehicle for carrying garlic to the palate. The juxtaposition of beets and celery roots in the CSA box started me thinking about basing skordalia on celery root instead of the more traditional starches. Celery root’s subtle flavor, with hints of both celery and parsley, seemed as if it would combine perfectly with garlic. Two root crops, served together at the peak of their season, appealed to my sense of seasonality. Celery root skordalia turned out just as I imagined: delicious and a terrific accompaniment for roasted beets. In addition to the pungent taste of garlic that is the hallmark of correctly prepared skordalia, the herby flavors of celery root added complexity and interest to one of my favorite dishes. Yesterday my skordalia was made only with celery root; it would also be good had I used a combination of celery root and pureed potatoes. One of the challenges celery root presents for the cook is that it is not uniformly shaped, and can look like a misshapen ball of tangled roots. Many people avoid buying celery root because they are not sure how to reach the edible portion of the vegetable. If you are one of those people, don’t worry, prepping celery root is easy. Please visit my new website!! Fantastic Laurie! 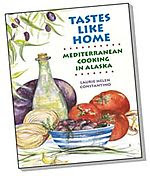 Fall ingrdients, Greek cookery...great fusion! This is really fascinating! I've always wanted to (a) make skordalia and (b) finally try cooking with celery root - you've come up with a way to let me do both at once! I can't wait to try it out! Sounds wonderful. I haven't cooked with celery root, and I'm not even sure I've tasted it. But I love Greek food, so I'm sure I would like this. thanks for leaving a comment on my blog.Your blog is very interesting.I will have to digg it when I find more time. I have never eaten roasted celery root before and I'd love to try it. Thanks Peter, you are always so kind! Danielle, hey, I'm a person who thinks skordalia makes a great breakfast, though understand I may be in the minority. I hope you like it made with celery root! Kalyn - celery root is definitely an underused vegetable, but also worth trying. And I know you try to eat lower carb, so this would be a good choice for you. Isil - Thank you for the kind comments about my blog. 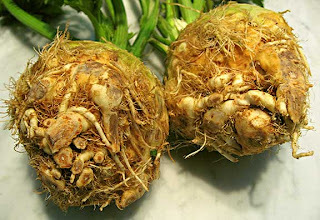 Roasting celery root is easy, and in my opinion, accentuates the celery root flavor. I hope you like it! I finally tried this out, but I actually made the skordalia with parsnip instead of celery root. Really, really tasty. Thank you again!